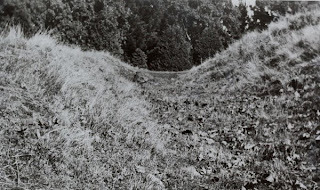 This photo below shows the ditch or entrenchment at the Papatoetoe Pa. Both of these photos were taken in 1948. Today the remains of Papatoetoe Pa lie adjacent to the Papatoetoe cemetery; now part of the Manukau Garden of Memories. There was another pa was on a small headland opposite Auckland Airport. Today this headland is called Chapel Point. The headland marks the junction of the Waokauri and Pukaki Creeks. The pa’s archaeology reveals that after the first occupants left, it stood empty for a long time before being reoccupied. This sequence is common to recurring periods of unrest and warfare. 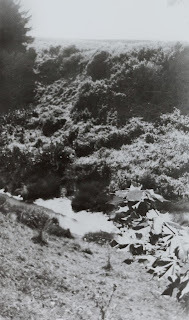 There was another pa site where Self’s Quarry is located today. Archaeologists think this would have been a small defensive terraced pa on a volcanic cone. This pa was the centre of a large complex of sites. Over the whole area between the two main branches of the Waokauri Creek there is evidence of middens, terraces, scoria-faced platforms, pits rock shelters, gardens and other habitation sites. The pa complex may have been occupied over an extended period. In New Zealand it is illegal to damage or modify an archaeological site without prior consent from the New Zealand Historic Places Trust. All archaeological sites are recording as part of the New Zealand Archaeological Association's (NZAA) site recording scheme. This is important because it helps us protect these valuable heritage sites and the historical evidence that they represent.